While you’re trying to sell your home, you know that it’s important for the indoor air to feel fresh and unstuffy. Hence, you might open your windows during an open house held on a warm spring day. However, selling your home with a high quality of indoor air goes further than that. According to the Environmental Protection Agency (EPA), indoor air can be two to five times more polluted than outdoor air. There are surprising sources of indoor air pollution all over your house. The sooner you know about these sources, the sooner you can clean up the air quality of your home for your future buyer and, in the mean time, for you and your family. Some of the most common types of indoor air pollution include cigarette smoke, carbon monoxide and radon. To prevent these producers of pollution, always step outside to smoke, and try even stepping away from the doors to your house. Design a backyard patio or shed away from the house for you to smoke in. Make sure your house also has one or two carbon dioxide detectors, which are as important as smoke detectors. Some air purifiers, unfortunately, create more pollution than they destroy. Air purifiers kill mold and bacteria in your home by releasing ozone into the air, which is what the EPA has been working to decrease in outdoor air. Ozone causes lung tissue scarring, asthma attacks and more. TheDailyGreen.com provides a list of potentially dangerous air purifiers here. Paint has been a leading cause of indoor air pollution for decades, with lead paint being banned about 30 years ago. Still, many older houses still contain lead paint, so make sure to maintain paint in old houses well so that cracking or peeling pieces of lead paint aren’t touched and lead isn’t spread. New paints also contain high levels of volatile organic compounds (VOC) that can be damaging when breathed even in low doses, so use low or no-VOC paint, and ventilate well when painting. Carpets are often made with chemicals that could cause asthma attacks or lung damage, such as formaldehyde. Your best bet is to purchase carpeting that is made with nontoxic materials, or better yet, to replace carpeting with hardwood, ceramic, bamboo or other types of flooring that don’t collect dirt, dust mites, fungus and other unhealthy pollutants. If you have carpets, vacuum often, preferably with a high efficiency particle air (HEPA) vacuum. Cleaning supplies trigger air pollutants that, if mixed incorrectly, could even be deadly. Mixing cleansers with chlorine and acid-based cleaners, such as vinegar, create chlorine gas that is deadly. Many other cleansers contain toxic pesticides and chemicals that are dangerous to our health. Mixing a spray bottle of vinegar and water, or wiping a surface with baking soda and water, works just as well. 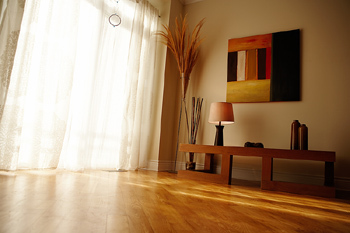 To learn more about indoor air quality, read this article from TheDailyGreen.com. By removing these five sources of indoor air pollution, you can make your home’s air quality more safe and desirable for you and your future buyers. During open houses and tours, explain the changes you made to your potential buyers so that they know how clean the air is at the home that might soon be theirs.